If you've been following my blog a bit, you may have already seen my post about My Favourite Ways to Warm up my Students for Guided Reading. Some days are less than ideal in maternelle, and you won't always have time for an elaborate warm-up activity! Take Tuesday, February 19th for example. How do I remember the exact date? Well, that was the day of the February full moon! Enough said, I'm guessing, haha - if you teach kids (of any age! ), I'm sure you know EXACTLY what kind of day it was! My students were literally and figuratively Bouncing. Off. The. WALLS. There was NO WAY they could do their literacy centres for 20 minutes straight, affording me all the time I would need to work with my groups. But, I had to see my groups, so I tried anyway, and WOW. By the end of Round 1, I had one student covered head to toe in marker, and another who apparently ate an entire crayon. That day, I decided I needed to add a quick-but-effective guided reading warm-up alternative to my repertoire; something that would help me get through my groups as quickly as humanly possible. 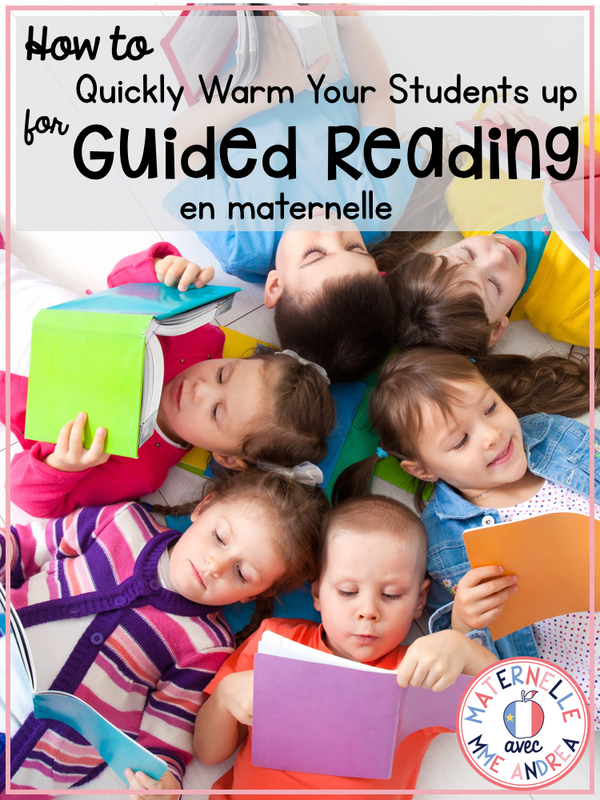 Read on for my new favourite 2 minute guided reading warm-up activity! 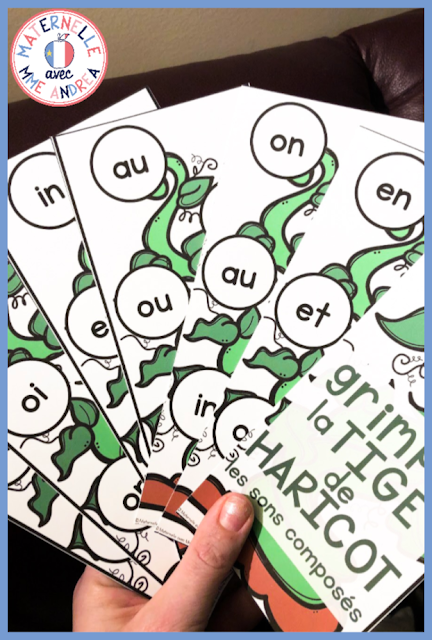 This quick little activity that I came up with I call « Grimpe la tige de haricot ». Not super catchy, but there you have it haha. There are a variety of cards for a variety of skills - consonants, vowels, sons composés, and consonant + vowel blends. 1. Print, laminate, and cut the desired cards. You may choose to print them all, and use different cards for different groups (that's what I do). I also put them on binder rings, with the cover pages at the front, so I can easily keep track of the cards and grab the set I need. 2. Give each student a card. You will want to choose a card that contains mostly letters, sounds, or syllables that your student can read or identify on their own. However, it is ideal if there are one or two new letters or sounds. 3. Each student will start at the bottom of their beanstalk, and try to "climb" to the top by reading each letter/sound/syllable correctly. If they make a mistake, you can give them the answer, but they start back again at the bottom. 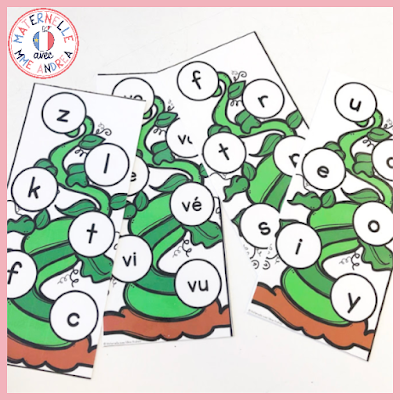 I find that the repetition in this activity when they make mistakes really helps my students become more fluid with reading their letters, syllables, and sounds. If you have students who are really good at this warm up and rarely make mistakes, you can set up a 1-minute sand timer and challenge them to read as many cards as they can before the timer runs out. They can try to beat their partner, or you can keep track of how many they read successfully each lesson and see if they can beat their previous total. Also, this warm-up will only not be frustrating for your students if they are able to experience success after a few tries. Some students may only know one or two letters, and will not find success with the cards I provide - but they can still play! I have included an editable page of cards, so you can ensure that each student has a card with which they will find success. For example, for my student who currently only knows three letters, I pick one new letter I want him to practice, and mix it in with the letters he knows. Since he knows x, D, and O, I would might put x - s - O - s - D on his card, and encourage him to learn s.
You may also choose to add sounds that I didn't include, or try blends with three letters or short sight words. You could also mix up upper- and lowercase letters on the same card. If you're interested in giving this warm up a go, I've already done all the work for you, put it into an editable resource, and added it to my TPT store. >>> You can see it by clicking RIGHT HERE. If you give it a try, I would love to hear about it!